As temperature extremes and dramatic weather events increasingly remind us, the climate is changing, and with very dire effects on the global landscape. But if you’re a cartographer, you’re in for some good news, because rising sea levels are projected to make Australia into a simple, easy-to-draw rhombus by 2045. The National Ocean Service’s study says in no uncertain terms that if mankind doesn’t act soon, rising sea levels will render the world’s coastal regions uninhabitable, displacing hundreds of millions of people and driving crucial wildlife to extinction. But on the plus side, it should be a field day for cartographers, who will save hours upon hours of time drawing Australia every year, freeing them up to pursue outside interests and perhaps even cut out of work a little early now and then. 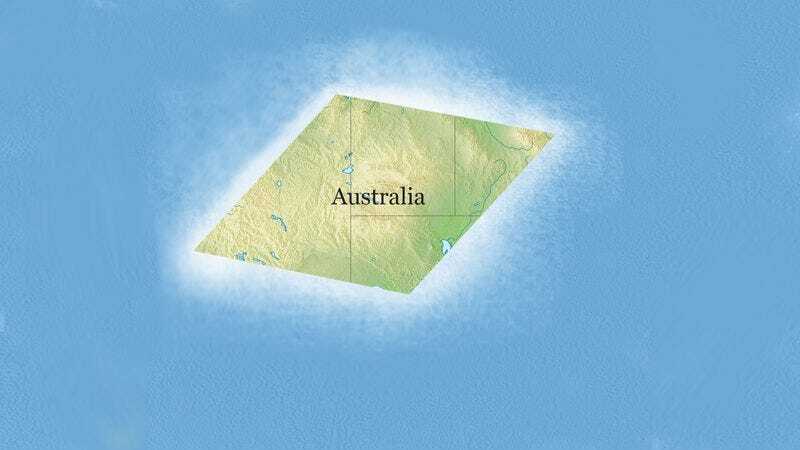 Australia becoming a rhombus will pretty much be a game changer for anyone in the map-drawing industry, and it’s encouraging to see that there will at least be one upside to the catastrophic destruction of climate change. Get those T squares ready, cartographers, because soon your work will be getting a lot more geometrical!